Adds or edits a contact. Click <Add...> or <Edit...> button on the Contacts manager interface. [eMail address] - must be filled. [Full name] - must be filled. [Full name] + [eMail address] - uniquely identifies a contact. [Birthday] - cannot specify the future date, and age cannot be greater than 169. Default: 25 years ago, easy to adjust. [Uses template] - the email template that will be used to send birthday wish to current contact. [CC] - specify other contact(s) that can get a copy of the birthday wish for current contact. 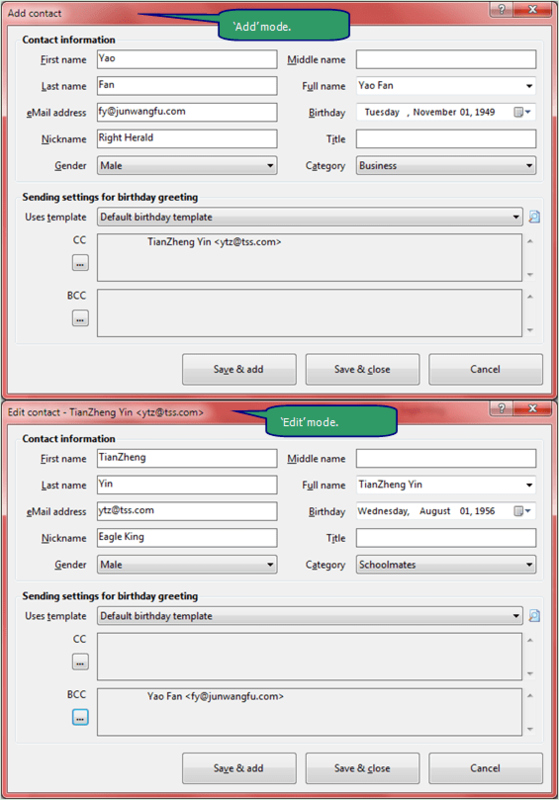 [BCC] - specify other contact(s) that can get a blind copy of the birthday wish for current contact. 1. Cannot include duplicate contact in CC and BCC contacts. 2. Cannot include current contact in CC and BCC contacts. 3. The maximum of CC and BCC contacts is 96. <Save & add> - saves current contact and adds a new one. <Save & close> - saves current contact and closes this dialog box.